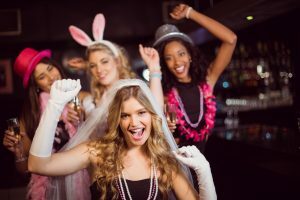 First; three months before the bachelorette party, begin your initial plans and decide if the party should be a surprise. If it is not, get ideas from the bride on what she wants. Get a guest list from the bride and ensure that all people on the list are also invited to the wedding. If you plan the party to be a surprise, use your knowledge of the bride and consult with her loved ones for suggestions. Make sure that the activity you have planned is affordable for everyone involved. Second,;two months before the party, email the save the date notifications, so you will know if anyone involved has conflicts. Include as many details as possible if the party is far away or complicated for anyone to attend. Talk with the bridesmaids or the bride’s close friends to make detailed plans and to come up with party games. Third; send invitations a month before the party and include the cash contribution each party guest is expected to make. Give responsibilities to bridesmaids and the others involved. A week before the party confirm all arrangements, and buy materials for any games. PUTNAM PLACE offers 2 options with the best in services for your special party and will supply everything you need. Bachelorette Package #1 Up to 6 girls allowed, cover charge waived. Includes two bottles and complimentary party favors. Cost: Call or use form below to get more info. Bachelorette Package #2 Up to 16 girls allowed. Includes two premium bottles of alcohol, complimentary party favors and a bottle of champagne to start the night off right. Putnam Place provides you with everything you need to make your party a memorable one. Wine party- or Brunch Party. A tea party with a variety of teas, desserts, and mini sandwiches. We can supply a DJ or even turn Putnam Place into a intimate piano bar with your requested theme. Contact Putnam Place to plan the ultimate Bachelorette Party! Let the party begin!